Transfer presses combine the best features of compression molding with all the advantages of injection molding. A transfer press, like a plastic injection molding machine, has the capability to produce plastics with high productivity. They can be programmed to perform a precise task repeatedly, with the same accuracy every time. 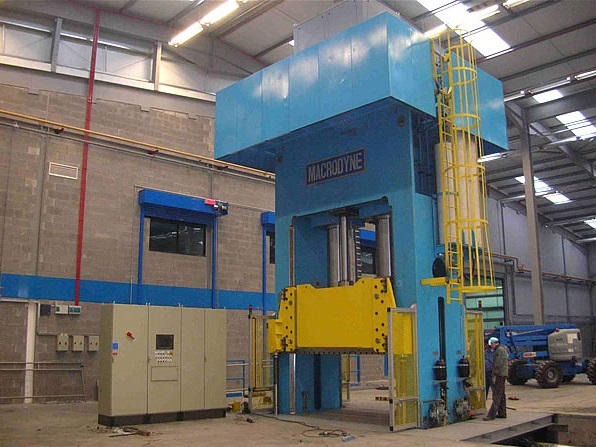 Transfer presses, like standard hydraulic presses, are usually made from stainless steel and are designed to handle extremely heavy loads, reaching 3500 tons. These machines can be large single or multi stationed, or small machines which can handle about 15 tons.These systems can be used for the molding of encapsulated electronics, medical products, insert molded plugs and connectors, rotors and sensors. They may also stamp automotive hoods, roof panels and other sheet metal parts. Industries such as automotive, sporting goods, medical, military, composite and electronics enjoy the dimensional stability, speed and accuracy transfer presses offer. Though transfer presses are often operated in conjunction with other manufacturing systems, they are a critical part to the production process, especially for companies who require a quick turnover. Transfer presses work by feeding flat plastic, rubber or metal blanks automatically into the right end of the press. From there, feed bar fingers take the part and move it from die to die. There are two types of transfer motions used in transfer presses; the simplest system uses dual-axis motion. The first axis moves in and out, centering the part in the transfer press; the second axis motion transfers the part from die to die. The second system is the tri-axis motion, which is used for indexing parts between dies in the transfer press. The transfer feeder bars are mechanically driven synchronously with the slide motion, and the feed bar fingers inserted into the transfer feeder bars hold the part during indexing. In some cases, the fingers use pneumatic jaw clamps to grasp the part; however, simple scoops that rely upon gravity are used whenever possible. Transfer presses differ from hydraulic presses mostly in their productivity rates. Unlike a transfer press, a hydraulic press does not contain feed bar fingers that can move a product through its stamping process and from die to die with a decreased need for manpower. 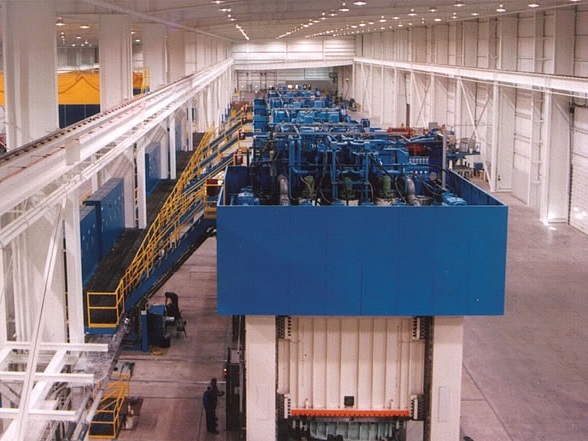 Hydraulic presses also cannot perform at the rate a transfer press can or at as low of power consumption. Transfer Press A transfer press, which is a type of hydraulic press, is used for stamping and molding of plastic, rubber and metal industrial products.